The first thing that kame to my mind when I saw this buggy was, "Dickie?" "I've never heard of this company." A number of their vehicles interested me though, so I ended up getting 3, and this was the smallest (10" long, about 1/16th scale) and cheapest among them. 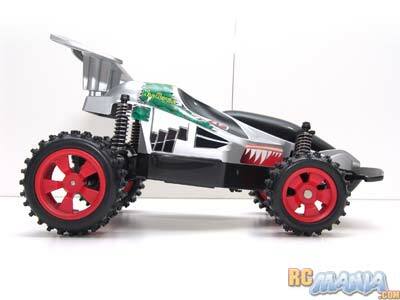 It's a rear-wheel-drive racing buggy with working suspension. It comes with all the batteries you need to run, which I really appreciate. As soon as I took it out of the box, just the feel of it in my hands made me raise an eyebrow. It felt much better-designed than I expected. The front springs are soft. All 4 tires feel really grippy. The steering of the front wheels feels firm. Definitely not the typical made-for-5-year-olds feel. I couldn't wait to try it out and see how it drove. 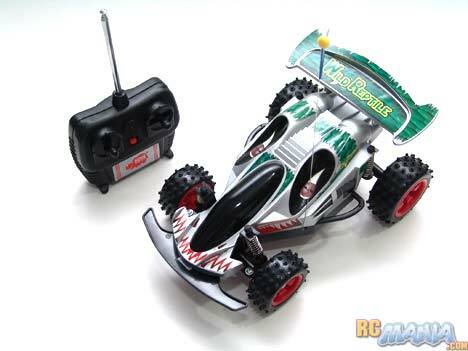 I say this all the time, but I just can't overstate how happy I am when an RC comes with batteries. This one uses alkalines, so they can't be reused, but at least they get you going and you can get more later or replace them with long-lasting rechargables once they run out. The Wild Reptile buggy has a feature on its battery compartment that I've never seen before. It's kept closed by both a screw and an easy-to-release latch. Using a screw is important for safety with younger kids (parents should handle battery changes), but for older kids you can take out the screw and let them use the easy latch for the sake of convenience. The controller doesn't have this feature (it uses a screw only), but controller batteries last a really long time by comparison, so I can't complain. I went from sealed box to driving in a matter of minutes, and how happy I was. The little buggy actually has good speed for its small size. As I thought, the steering is strong and it can quickly turn in a surprisingly small circle even on carpet, where many small RCs get bogged down in the turns. The soft suspension really works and allows the lil' Wild Reptile to spring its way over many bumps. It can even do small jumps! The large front bumper has a good shape and size, too, protecting the car from damage in head-on collisions. I'm convinced! This is a good little buggy! I may have never heard of the manufacturer before, but now I'm definitely looking forward to trying more of their products. I got this one at KB Toys, and I've also seen it sold at eToys.com online. Dickie is a German company and judging from the numerous languages on the back of the box and in the included manual, these cars are sold all around the world. Honestly, the Wild Reptile is a little on the expensive side for its size and target age range, but I feel that I paid for best-in-class performance and really got my money's worth.